Despite the name, this sunflower ranges less far west than many, and is in fact concentrated in Michigan and Wisconsin, less common southward. It is characteristic of our dry, very open, usually sandy savannas, such as jack pine and oak plains. 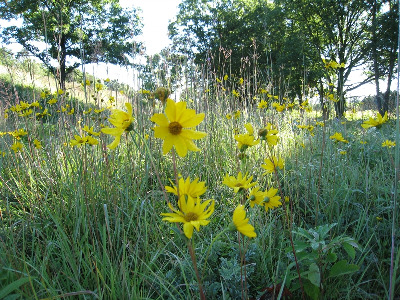 It has also spread along railroads and in fields, and is found in dry prairies. This is a very easily recognized species with the few leaves concentrated at the base of the plant, nearly naked stem, and colonial habit resulting from slender, shallow, pale rhizomes, which usually produce an abundance of leaf rosettes in a colony. MICHIGAN FLORA ONLINE. A. A. Reznicek, E. G. Voss, & B. S. Walters. February 2011. University of Michigan. Web. 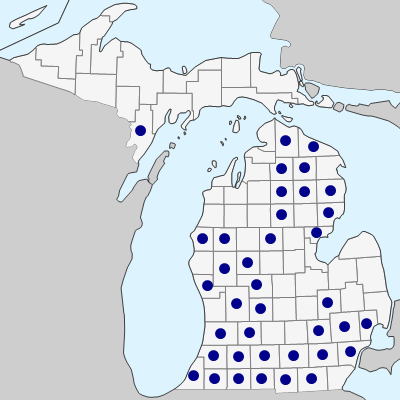 April 21, 2019. https://michiganflora.net/species.aspx?id=355.